Already at the entrance with the comfortable reception you�ll discover the welcoming atmosphere of our house and feel welcome. Our comfortable and spacious apartments with balcony or terrace, some with direct access to the garden, have a fully equipped kitchen, satellite TV, Internet access, direct dial phone, safe, hair dryer, bed linen, towels, table cloths and tea towels. The house disposes of an elevator, a laundry room for guests, a ski depot with ski boot dryer, a large garage, a parking place and a garden with children�s playground. Ideal holiday destination for skiers and hikers, with a wide choice of leisure activities in a breathtaking mountain scenery. 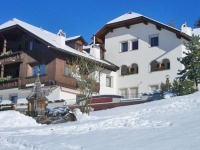 The Residence Prapoz is situated in a quiet and sunny dream location of Ortisei. The house is located in the middle of the green, with a large garden on the edge of the wood. The center of Ortisei with the pedestrian area is reachable by foot in approx. 10-15 minutes. Excellent starting point for walks and excursions (directly from the house). Ski bus stop at approx. 200 m and lift facilities at approx. 800 m.